By car: From the north, east or west. 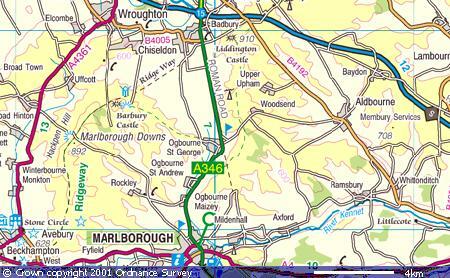 M4 junction 15, take the A346 for 4 miles towards Marlborough. Turn off main road after passing the Ogbourne Downs Golf Club. From the south: A346 through Marlborough, then 3 miles towards Swindon. From Marlborough, go past Southend and Hallam, then take the next left. When you enter the village, you will go past the 30mph speed limit sign and a public telephone box. As you do, look for the second house on the right. From Swindon or Aldbourne, go under the main road, past "The Inn With The Well", then look for the last-but-one house on the left. By train: First Great Western trains to Swindon or Bedwyn. Our personal experience is that tickets from (say) Paddington to Bedwyn are substantial cheaper than to Swindon. Then by the number 20 or 22 bus to Marlborough or taxi. If you are going the other way, back to Paddington, don't miss your chance to stop and say Hello to the work-famous Paddington Bear at Paddington Station. By National Express coach: From Heathrow airport, get the X403 or 222 coach. From Gatwick airport, get the 222 coach. All coaches on the 222 route go to Swindon. From London Victoria or Earls Court, get the X403 coach. That route usually goes to Swindon via Heathrow airport. Alternatively, some of the X403 coaches go via Marlborough town centre, which is more convenient but less frequent. Please check the X403 timetable carefully to see which route is being used. As far as we know, people need to book seats on the express coaches in advance. We suggest you do that at least a month before travel, to make sure you do have a seat booked. If we are not meeting you, your safest option is to get off at Swindon Bus Station, and find a taxi or the local bus from there. The Coate Water stop is well outside the centre of Swindon and we’ve never seen any taxis waiting for passengers there. If you get off at the Coate Water stop, on the way into Swindon, you’d need to cross the main dual-carriageway road to find the matching stop for the local buses coming out of Swindon towards Marlborough. Alternatively, the Salisbury Reds (was Wilts and Dorset) route X5 from Swindon or Pewsey. This route stops on the village by-pass, and does not come through the village itself. From the bus stop on the A346, it is a five minute walk. By air: To the airstrips at Draycott or Lower Upham, (colloquially known as Swindon Airport, but in reality only used by light/private aircraft) Both of which are about two miles north. There are just two roads running through the village, skirted by the Roman Road. We are on the B-road which runs from near Southend and Hallam. 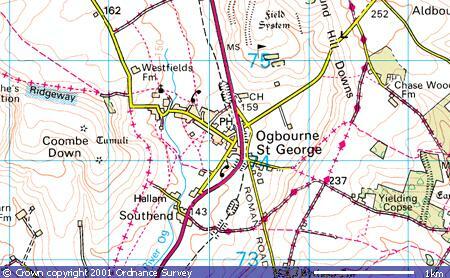 It goes under the main A346 road and then over the downs to Aldbourne.